One of the biggest causes of injuries during a an earthquake is being struck by falling furniture and other dangerous objects. 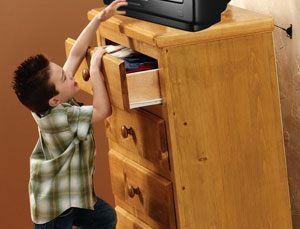 The best way to prevent injuries is to secure heavy furniture, electronic equipment, large televisions, cabinet doors, and other dangerous items that can fall and case injuries or block your evacuation path. Safety straps are easy to install and secure heavy furniture and other dangerous objects to the wall which prevents them from falling. Stop injuries before they happen.